Mounting evidence suggests that the richer and more diverse the community of microbes in your gut the lower your risk of disease. Diet is key to maintaining diversity and was strikingly demonstrated when an undergrad student went on a McDonald’s diet for ten days and after just four days experienced a significant drop in the number of beneficial microbes. Similar results have been demonstrated in a number of larger human and animal studies. Your gut microbiome is a vast community of trillions of bacteria that has a major influence on your metabolism, immune system and mood. These bacteria and fungi inhabit every nook and cranny of your gastrointestinal tract, with most of this 1kg to 2kg “microbe organ” sited in your colon (the main bit of your large intestine). We tend to see the biggest diet-related shifts in microbes in people who are unhealthy with a low-diversity unstable microbiome. What we didn’t know is whether a healthy stable gut microbiome could be improved in just a few days. The chance to test this in an unusual way came when my colleague Jeff Leach invited me on a field trip to Tanzania, where he has been living and working among the Hadza, one of the last remaining hunter-gatherer groups in all of Africa. My microbiome is pretty healthy nowadays and, among the first hundred samples we tested as part of the MapMyGut project, I had the best gut diversity – our best overall measure of gut health, reflecting the number and richness of different species. High diversity is associated with a low risk of obesity and many diseases. The Hadza have a diversity that is one of the richest on the planet. The research plan was devised by Jeff who suggested I should have an intensive three days of eating like a hunter gatherer during my stay at his research camp. I would measure my gut microbes before heading to Tanzania, during my stay with the Hadza, and after my return to the UK. 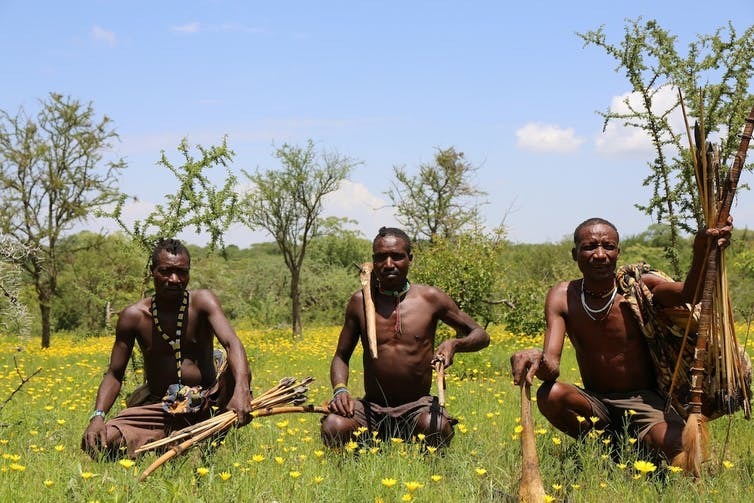 I was also not allowed to wash or use alcohol swabs and I was expected to hunt and forage with the Hadza as much as possible – including coming in contact with the odd Hadza baby and baboon poo lying about. To help us record the trip I was accompanied by Dan Saladino, the intrepid presenter and producer of BBC Radio 4’s The Food Programme, who was preparing a Hadza microbe special. After a long tiring flight to Mount Kilimanjaro Airport in Tanzania, we stayed overnight in Arusha, a city in the north of the country. Before setting off the next morning, I produced my baseline poo sample. After an eight-hour journey in a Land Rover over bumpy tracks, we arrived. Jeff beckoned us to the top of a huge rock to witness the most amazing sunset over Lake Eyasi. Here, within a stones throw of the famous fossil site of Olduvai Gorge and with the stunning plains of the Serengeti in the distance, Jeff explained that we were never going to be closer to home as a member of the genus Homo, than where we were standing at that moment. 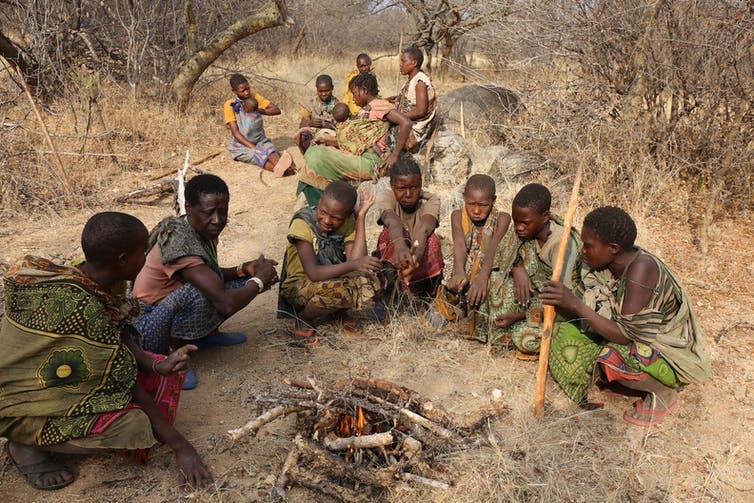 The Hadza seek out the same animals and plants that humans have hunted and gathered for millions of years. Importantly, the human-microbe tango that played out here for aeons probably shaped aspects of our immune system and made us who we are today. The significance of being in Hadza-land was not lost on me. Unlike the Hadza, who sleep around the fire or in grass huts, I was given a tent and told to zip it up tight as there were scorpions and snakes about. I had to be careful where I stepped if I needed a nocturnal pee. After an interesting but restless night’s sleep, a large pile of baobab pods had been collected for my breakfast. The baobab fruit is the staple of the Hadza diet, packed with vitamins, fat in the seeds, and, of course, significant amounts of fibre. We were surrounded by baobab trees stretching in the distance as far as I could see. Baobab fruit have a hard coconut-like shell that cracks easily to reveal a chalky flesh around a large, fat-rich seed. The high levels of vitamin C provided an unexpected citrus tang. The Hadza mixed the chalky bits with water and whisked it vigorously for two to three minutes with a stick until it was a thick, milky porridge that was filtered – somewhat – into a mug for my breakfast. It was surprisingly pleasant and refreshing. As I wasn’t sure what else I would be eating on my first day, I drank two mugs and suddenly felt very full. My next snacks were the wild berries on many of the trees surrounding the camp – the commonest were small Kongorobi berries. These refreshing and slightly sweet berries have 20 times the fibre and polyphenols compared with cultivated berries – powerful fuel for my gut microbiome. I had a late lunch of a few high-fibre tubers dug up with a sharp stick by the female foragers and tossed on the fire. These were more effort to eat - like tough, earthy celery. I didn’t go for seconds or feel hungry, probably because of my high-fibre breakfast. No one seemed concerned about dinner. A few hours later we were asked to join a hunting party to track down porcupine – a rare delicacy. Even Jeff hadn’t tasted this creature in his four years of field work. Two 20kg nocturnal porcupines had been tracked to their tunnel system in a termite mound. After several hours of digging and tunnelling – carefully avoiding the razor-sharp spines – two porcupines were eventually speared and thrown to the surface. A fire was lit. The spines, skin and valuable organs were expertly dissected and the heart, lung and liver cooked and eaten straight away. The rest of the fatty carcass was taken back to camp for communal eating. It tasted much like suckling pig. We had a similar menu the next two days, with the main dishes including hyrax – a strange furry guinea-pig-like hoofed animal, weighing about 4kg – a relative of the elephant, of all creatures. Harvested high from a baobab tree, our dessert was the best golden orange honey I could ever imagine – with the bonus of honeycomb full of fat and protein from the larvae. The combination of fat and sugars made our dessert the most energy-dense food found anywhere in nature and may have competed with fire in terms of its evolutionary importance. 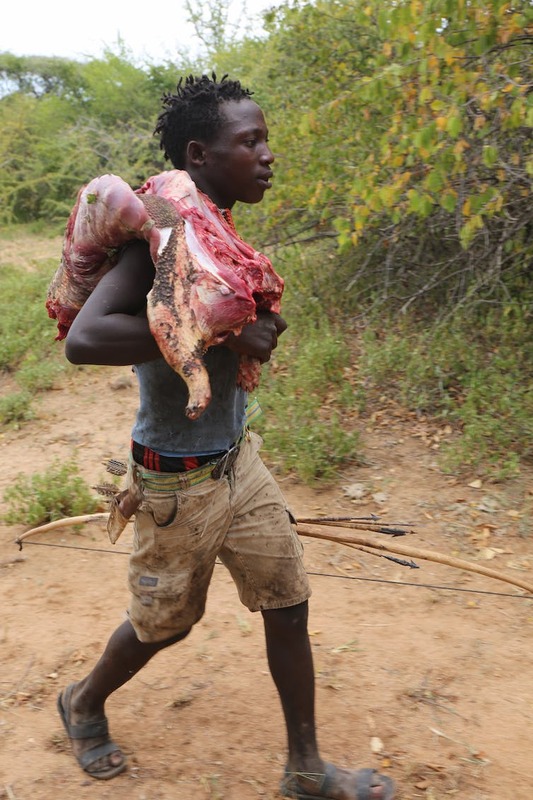 In Hadza-land nothing is wasted or killed unnecessarily, but they eat an amazing variety of plant and animal species (around 600, most of which are birds) compared with us in the West. My other lasting impression was how little time they spent getting food. It appeared as though it took just a few hours a day – as simple as going round a large supermarket. Any direction you walked there was food – above, on and below ground. Twenty-four hours later Dan and I were back in London, him with his precious audio tapes and me with my cherished poo samples. After producing a few more, I sent them to the lab for testing. The results showed clear differences between my starting sample and after three days of my forager diet. The good news was my gut microbal diversity increased a stunning 20%, including some totally novel African microbes, such as those of the phylum Synergistetes. The bad news was, after a few days, my gut microbes had virtually returned to where they were before the trip. But we had learnt something important. However good your diet and gut health, it is not nearly as good as our ancestors’. Everyone should make the effort to improve their gut health by re-wilding their diet and lifestyle. Being more adventurous in your normal cuisine plus reconnecting with nature and its associated microbial life, may be what we all need.